Bandroom News: Penultimate division rehearsal this week! The World’s largest annual celebration of music is Monday May 1st. Our East Junior Showband students under the direction of Ms. Worman will be performing at a Prairie Spirit School Division Music Monday concert in Warman. The concert will feature staff and students from across the division and starts at 7:30pm at Warman Middle School, entry by donation. We are already left with just TWO division rehearsals until the final concert. Attendance at these curricular rehearsals are VITAL to prepare for our final Spring concert. PLEASE ensure that students attend this Wednesday May 3rd. We would like to welcome two University of Saskatchewan Education students to the division in one and three week placements. Benjamin Black and Shannon Butler will be accompanying Mr. Martin over the next few days and weeks. Please stop to say hi if you see them around! If anyone has any band instruments at home that are unused, or know of someone that does, the Beginner Band+ program is looking for instruments to build capacity in each of our 7 communities for grades 5 and 6. Please contact Mr. Martin (will.martin@spiritsd.ca) if you would like to donate or sell any instruments. May 29th – Spring Concert East – Lakeview Church 7pm. For anyone with spare time over the weekend or senior students in need of a concert to review please check out some of the great shows this weekend. 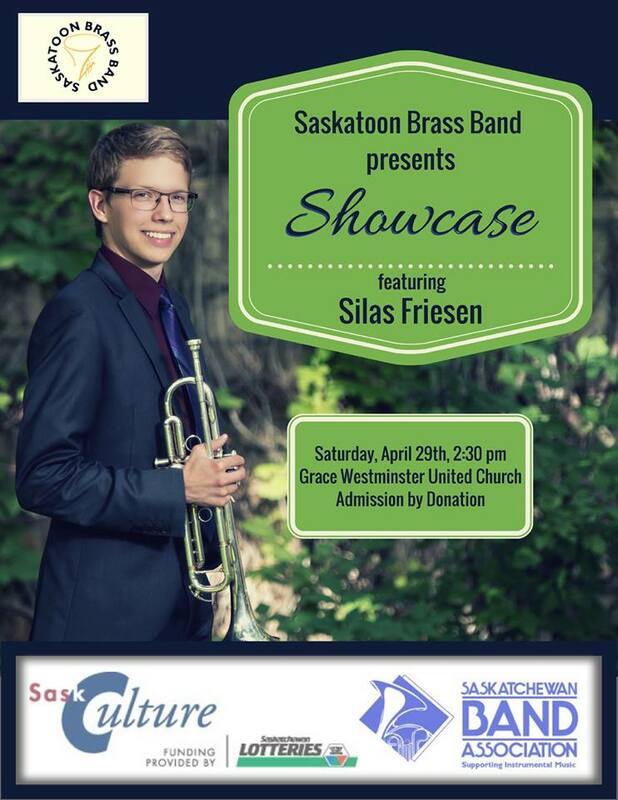 Saskatoon Brass Band presents: ‘Showcase’ (Featuring Silas Friesen – Trumpet) Saturday April 29th – 2:30pm Grace Westminster United Church, Admission by donation. Hope everyone had a great Easter Break! Seniors need to confirm attendance or non attendance on tour AT THE LATEST BY WEDNESDAY APRIL 26th to Mr.Martin so hotel, restaurant, activities and final cost can be booked definitively. The East Band Program is reaching out to ask for any instrument donations or sales to build our school inventory for the coming 2017/18 school year for beginner band +. Each of our East schools is building their own inventory of instruments. Please contact Mr. Martin if you know anyone that might have an instrument to donate or sell to any East School.